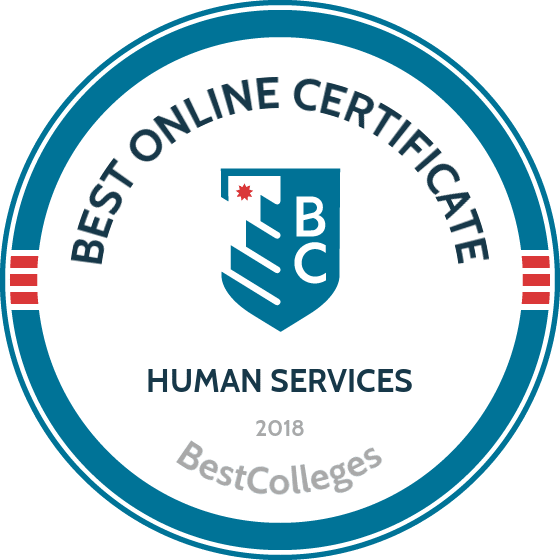 What are the Best Online Certificate in Human Services Programs? What Else can I Expect From an Online Certificate in Human Services Program? What Can I Do With a Human Services Certificate? Graduates of human services certificate online programs are prepared for a variety of professions. Whether you want to work with children, the elderly, or individuals who require specific social services, you'll be qualified for employment at health and welfare agencies, educational institutions, hospitals, and community centers. Due to the aging baby-boomer population, the demand for home services is growing; employment of home health aides is projected to grow by a staggering 38%, which is much faster than the average job in the U.S. According to the Bureau of Labor Statistics (BLS), employment of social and human service assistants is also projected to grow considerably (by 11%) by 2024. Penn State's human services certificate online program teaches students about the stages of infant, child, adolescent, and family development. This 30-credit undergraduate certificate in children, youth, and family services requires classes such as values and ethics in health and human development professions, effective speech, and rhetoric and composition. For graduates pursuing further education, the human services certificate can be applied to Penn State's associate in science or bachelor's of science in human development and family services. The format varies among online courses, but all online classes are interactive and are designed for working professionals. Online coursework is delivered through Blackboard and Skype. Applicants must have a high school diploma or GED. Indiana Wesleyan is a liberal arts evangelical Christian university located in Marion, Indiana. IWU's human services certificate online program allows distance learners to study sociology and psychology while meeting professional and personal obligations. Required courses include social problems, marriage and family, theories of personality, cultural anthropology, and crisis intervention. Online classes at IWU are asynchronous and are delivered in a workshop format. In each seven-day course, or session, online students may log in at any time to participate in discussions and to complete assignments, papers, video presentations, and team projects. Nine of the fifteen required credits must be taken at IWU. Applicants must have a high school diploma or GED. MCC offers several options for students earning a human services certificate online. Distance learners can pursue an aging services certificate, a direct support work certificate, a psychiatric mental health technician certificate, or a substance abuse recovery coach certificate. Online coursework is delivered through Blackboard and includes classes such as values of human services in a contemporary society; group dynamics; drugs, society, and human behavior; crisis intervention; and psychosocial aspects of death and dying. Students typically complete this undergraduate certificate in human services in eight months. Applicants must submit a high school transcript or GED scores. Online students pay in-state tuition, regardless of state residency. CCC offers an affordable human services certificate program that provides students with general information on working with families, children, and adults. By exposing students to progressive thinking and providing hands-on experiences, the program prepares graduates to enter the workplace or to pursue further education. Classes include helping theories and intervention strategies, crisis intervention, and cultural anthropology. Students complete a three-credit human services practicum. Online courses are delivered through the Canvas learning management system. Students complete readings, take quizzes and exams, watch videos, and write papers. Online students participate in asynchronous online discussion boards, and some classes incorporate live chat sessions. Founded in 1962, Franklin Pierce is a private, nonprofit university. Franklin Pierce offers an online human services certificate that prepares students to work in sociology, psychology, criminology, and business. Courses include child and adolescent development, social psychology, race and ethnic relations, community organization, poverty and wealth, and counseling techniques. Students gain technical and leadership skills, values, and knowledge of individual, family, and community development. Online courses are delivered through Canvas and may be completed on a part-time or full-time basis. Applicants must have a high school diploma or GED. Online students have access to resources such as career services and academic support. Infant and Child Development: Child development courses examine the physical, cognitive, psychosocial, behavioral, biological, and psychological developmental processes that occur during infancy and childhood. Topics include historical philosophies, contemporary issues, and intervention methodologies. Marriage and Family: Marriage and family courses examine the social functions of a family. Topics include issues in contemporary society, intimacy, love, dating, cohabitation, family planning, child birth, child-rearing, parenting, divorce, and family violence. Death, Dying, and Grief: Death and dying courses examine the conceptual framework of death, grief, and bereavement. Students learn about theoretical, developmental, and cultural perspectives of death with regards to attitudes, reactions, funeral practices, services, and coping mechanisms. How Long Does it Take to Get an Online Certificate in Human Services? Several factors can affect the length of your human services certificate online program. Distance courses tend to be the most flexible option for learning; many students work full-time jobs and earn their certificates by taking classes on a part-time basis. Some distance learners obtain their certificates while simultaneously working towards their associate or bachelor's degrees. Alternatively, other students prefer to complete their certificates first, on a full-time basis, with the option of eventually applying their earned credits towards a degree. Because of these factors, certificate programs do not tend to be cohort based. Instead, they are completed at a personalized pace at your convenience. Most undergraduate certificate programs require the completion of 15 to 18 credits and can be finished in fewer than 12 months. Earning a certificate and earning a degree are not the same. While both are academic endeavors that can increase your chances of finding a job, certificate programs are highly specialized, focus on practical training, and include limited coursework. Alternatively, degree programs require more of a time commitment and are more expensive. Social and human service assistants work with social workers and psychologists to find and obtain benefits and community services for their clients. Human service assistants may also be referred to as case work aides, clinical social work aides, family service assistants, social work assistants, addiction counselor assistants, and human service workers. Childcare workers Childcare workers tend to young children. Duties include bathing and feeding, homework help, reading, playing, and teaching children how to solve problems and improve their social skills. Professionals may work in private or public daycare or preschool settings. Working under the direct supervision of nurses, home health aides are typically employed by certified home health or hospice agencies. They help people with chronic illness, disabilities, and cognitive impairment with daily life activities by providing medication, checking vital signs, changing bandages or dressings, and keeping records of care. Personal care aides, also called caregivers and personal attendants, provide self-care support and assistance for their clients. This includes hygiene-related tasks, housekeeping chores, shopping, budgeting, and transportation. They may engage clients in games, walks, or conversation; however, personal aides do not provide any medical services. Mental health/psychiatric technicians and aides provide therapeutic care and support for individuals with developmental disabilities and mental illnesses. They observe, listen, and record the behavior of their clients; help with daily activities; and provide medication and treatment. Associate in Science in Human Development and Family Studies: Human development and family studies associate degrees provide foundational knowledge about the human lifespan and family development. Some programs focus on adult development and aging, while others emphasize children, youth, and family services. Bachelor's of Arts in Human Services: A bachelor's of arts in human services teaches individuals how to improve the lives of children and adults through support, compassion, advocacy, and planned services. Students gain the knowledge and skills needed to work with various age groups at agencies, centers, and institutions. Bachelor's of Arts in Human Development: A human development degree focuses on the relationships that exist between individuals, families, social groups, and communities. Students in these programs learn about gerontology as well as how individuals develop skills and handle life challenges. Accreditation is a process that assures the quality of education at an institution. Regional accreditation is a comprehensive review of an entire school and is recognized across the country. It is important to choose an accredited school before pursuing an online human services certificate; if you're planning to go on and earn an advanced degree, most schools won't allow you to transfer credits from an unaccredited school. Additionally, potential employers might not accept a certificate from an unaccredited institution. There are several regional accreditation agencies in the United States, including the Middle States Commission on Higher Education, New England Association of Colleges and Schools, Northwest Commission on Colleges and Universities, and Southern Association of Colleges and Schools Commission on Colleges. Human services majors should also look for schools that have been accredited by the Council for Standards in Human Service Education (CSHSE), Accrediting Commission for Community and Junior Colleges, and/or the The Higher Learning Commission. Individuals pursuing a human services certificate online are not considered degree-seeking students; therefore, they are ineligible for federal financial aid, such as the Federal Direct Stafford Loan program. However, some schools offer deferred payments or installment plans for nondegree-seeking students in addition to private loans, grants, and scholarships. Applicants should apply for financial aid while they are applying for admittance into a program.